With titanium balls or Haematite balls. Lots of colours available.Can also be worn as an earring. 10mm Titanium Nose ring,BCR, Earring with Titanium Ball. 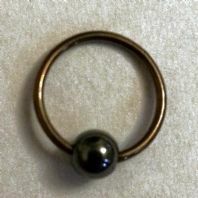 10mm Titanium Nose ring,hoop/earring with Haematite Ball,BCR.